Product Description: This product includes both front and back pins and latches for a hardtop convertible top, and includes latch cable and seal channels. 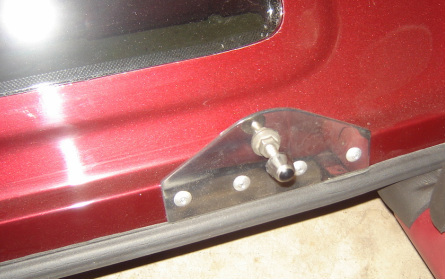 There are two latch plugs which fit into a receiver on the body of the street rod, behind the driver and passenger seats. Once locked in place, the latch cable is used to release the pins. In addition, seals or weather stripping are included to help seal the top from outside weather. Product Description: This product is an extension type hood prop for holding the vehicle hood open in six positions, each opening the hood approximately six inches more for each position. The hood prop fits into a ball type connector on the hood. See arrow. A spring loaded receiver fits over the ball to hold the hood prop to the hood. To remove the hood prop, the release sleeve is pulled down so the ball can be removed from the receiver. Product Description: This product includes a hand brake lever, support brackets, cables, and cable connectors to the rear wheel emergency brake hook-up. The location of this type of emergency brake system depends upon how much room is availalbe under the vehicle. Make sure the position selected has ample room and will not be restricted by the exhaust, frame, transmission or drive shaft. This particular application only had room in front of the passenger seat. There needs to be about 3 inches of room below for the assembly to work properply. interference. Its position must also be comfortable for the driver. In addition it should be close to the brake for ease of foot movement. When selecting tire size, make sure they will fit under the fenders without any obstructions, especially suspension range of movement and from front wheel turning. Also, make sure the front wheels can move the full range of turning. Also, as part of this vent there is a rollover valve, as shown by the arrow. Its purpose is to stop any fuel leakage in the event of a vehicle rollover. The center hole is used to attach the fuel sending unit to the tank. Its electrical connections hook up to the fuel gauge on the dashboard. Product Description: Different companies will provide specific body style parts. Once a decision has been made to build a specific style of street rod, the next step is to identify companies that can provide that style. The style used in this street rod was a Wild Rod 1937 Ford, hardtop convertible roadster. When the body parts were ordered and delivered, the following parts were received: two rear fenders, two front fenders, convertible top, hood, trunk lid, two running boards, the body, dashboard, center console, two doors, grill, and two side engine panels. Once the body parts were received, they were put together, making sure all parts fit correctly. Also note that the body parts still had parting lines in the fiberglass. A parting line is a raised area where the two molds fits together during manufacturing. These parting lines had to be removed during the sanding and painting of the vehicle. The arrow shows a parting line. It is also important to select the body style before having the frame manufacturered. The frame and body should match each other for safety and ease of installation.